Latin fever will sweep Liverpool this summer as the Liverpool Carnival Company and Orb Events are delighted to announce BRAZILICA a new international Brazilian carnival event for Liverpool, which promises to be the biggest carnival of its kind in the UK. BRAZILICA will be a massive 3 day event taking place across the city from Friday 15th – Sunday 17th July. The festival is an exciting expansion of Liverpool Carnival Company’s hugely successful carnival parade, which has existed since Liverpool’s Capital of Culture year in 2008 and attracted over 30,000 spectators in 2010. With irresistible rhythms, extravagant costumes, sparkling dancers and colossal floats there is guaranteed to be plenty of glitz and glamour and EVERYONE is invited to join in the celebration! BRAZILICA promises to be Liverpool’s most exciting, exotic and vibrant spectacle: a Rio-style Brazilian samba carnival exploding with life, music and dazzling costumes through the streets of the city centre. BRAZILICA is inspired by the exciting carnivals, which take place across Brazil during the weekend before the start of Lent. The most famous of these carnivals and arguably, the most famous carnival in the world is the Rio De Janeiro carnival, a snippet of which can be seen here. Fabio Aurelio, LFC footballer and Brazilian international said ‘It’s great to see Brazil and its carnivals celebrated in this way in Liverpool. 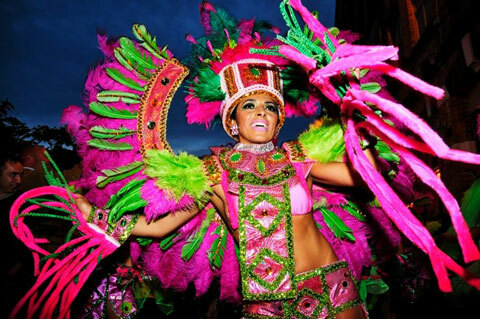 The samba atmosphere will remind me of home and I’m sure Brazilica will be a huge success’. In the build up to the festival; Liverpool Carnival Company will hold a series of classes, workshops, community & youth events and rehearsals that the whole community can get involved in, offering weeks of festival fun to those who’d like to get involved! As with the Rio de Janeiro carnival in Brazil, the aim of the Liverpool’s Carnival is to build jobs and industries in addition to educating the community for collective benefit. It’s a cultural catalyst to bring everyone together. More information on getting involved will be available within the coming weeks and those interested are asked to visit www.brazilicafestival.com for more info. On Friday 15th July Liverpool city centre’s shops and bars will play host to the ‘Samba in the City’ event, a colourful taster of the carnival, to get Liverpool in the mood to party. Saturday 16th July will see the city come to life ‘Latin style’ with Brazilian and South American inspired activities taking place around Liverpool throughout the day including a FREE all day South American street party, which will see open dance classes, music sessions, street football demonstrations and workshops taking place, with Brazilian food, drink and fun for all the family available throughout the day. The carnival steps up a gear in the evening as Liverpool’s streets are set ablaze with colour and the carnival parade of over 1,000 people makes its way to the festival site, winding through the city centre streets, whilst the Brazilian bands and DJs take to the stage for the party to begin! Festivities will continue well into the evening finishing with an exciting after part event at a city centre club. Wind down your weekend with Samba Sunday on 17th July as the carnival gets cultural with sports, film and artistic events taking place across the city. The anticipation is starting already as organisers recently confirmed that Brazilian Samba Group Nene de Vila Matilde will be flying in from Sao Paulo especially for the event. They’ll be performing alongside acclaimed UK Samba Group Paraiso School of Samba and local groups including Liverpool Samba School and Batala Liverpool. A full list of performers will be released shortly. With the Football World Cup in 2014 and the Olympics in 2016, Brazil is a country that is in prime position on the World’s stage and as Liverpool’s love of all things Brazilian continues to grow with a plethora of bars, restaurants, dance and sporting events popping up around the city the links and similarities between Liverpool and Brazil are becoming ever more clear. Our mutual love of sport, celebrated footballing histories and strong sense of community spirit mean that we have a lot in common, BRAZILICA promises to capture those similarities and the Latin Fever that is sweeping the city in a spectacular fashion, so get BRAZILICA 2011 (15 – 17 July) in your diaries and get ready to party with Liverpool Carnival Company. ARE YOU READY TO SAMBA?